Well we finally made it to Vermont’s Northeast Kingdom. 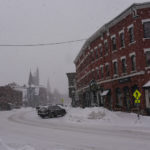 Named “Best Small Town” in National Geographic’s “Where to live and play”, St. Jay was a great place to start. A new foot of snow was coming down so we couldn’t stay long. If only I had listened to the “Eye on the Sky” weather forecast. Hallo Peter, do you know who is “responsible” for all that snow? It’s astonishing. In a few days we have carneval in Köln, Düsseldorf, Duisburg and the other cities, towns and villages around. The weather is going to be vernal not “vermontly”, in other words: it rains and rains, sometimes the sun is shining and then it rains and rains but there is no snow. I love snow and your snow-white paintings.What’s about ice? One of your fine lakes, frozen up, people on the ice…. Like Pieter Bruegels “Landscape in winter with birdtrap”. That could be nice. Love the angles, the detail….great job again! NEK is where my heart is always. I hope you will get to Newport and the beautiful Lake Memphremagog. Unfortunately the main street is a poor site but there is lovely church over looking the lake as well as other nice areas. That is definitely on my long list Wilma. Can’t wait to see it! I’m trying to savor the snow while it lasts, Cynthia… enjoying the moment and whatever today brings…that what I TRY to do. That said, I’ll be glad when spring arrives too! 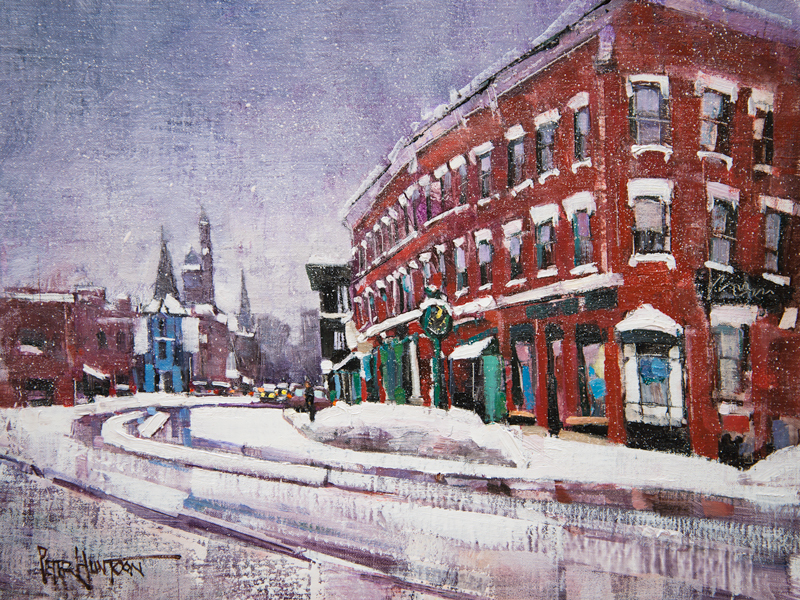 I LOVE this painting of St. Johnsbury! You are close to the firehouse where my son is now employed! He was working when they got all of that snow. Your painting makes me feel closer to him. Thank you! Have you ever gone by the old mill on Ward Road? It’s a spot I’ve always loved. Hello Kathy! Yes, I saw the fire house right there but ended up opting for this crop/composition. Glad I could help connect the dots a bit. It was a quick trip but I’ll try to investigate the old mill next time. Great job in capturing the 3-dimensional quality and finer points of that wonderful old brick building , all without actually painting a lot of detail……………the mark of a true artist! Another painting of winter in Vermont in all its glory. Beautiful!! Thanks Muriel, who knows how many more winter paintings we will get? Really like the angle on this painting of St. J, it really brings out the brickwork of the building, trim over the windows, and allows the eye to follow the curve to the buildings and steeples down the street. Very nice! Thank you Carol! I do enjoy composing for sure, and this view offered all the components I love in a street scene. So lovely, inspires me. I can only imagine trudging snowy streets with damp shoes and a red nose. Not hard to imagine is it Julie? It was indeed just like that. thank you! Thank you for this view of St. J. where I spent my youth, before moving to NYC and now in Italy. 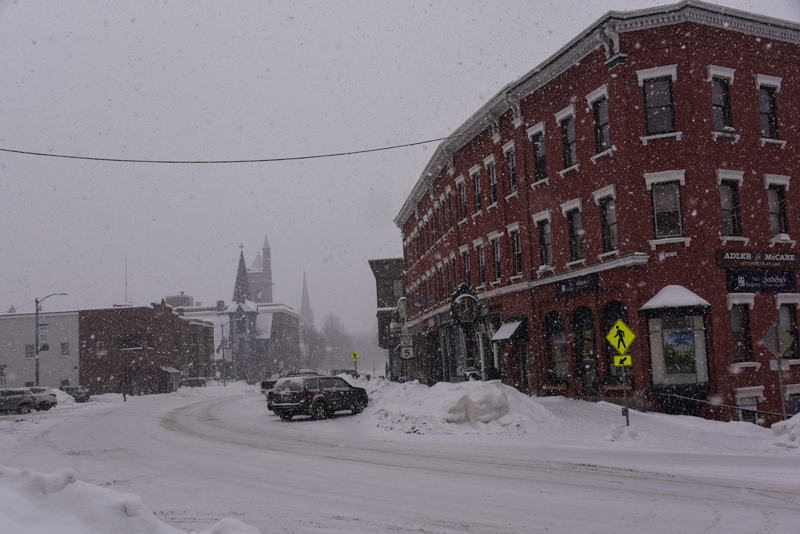 I love seeing all of the Vermont towns in your work. Italy is beautiful, but there is nothing like the NEK. Well, all the best to you from Vermont Elizabeth!